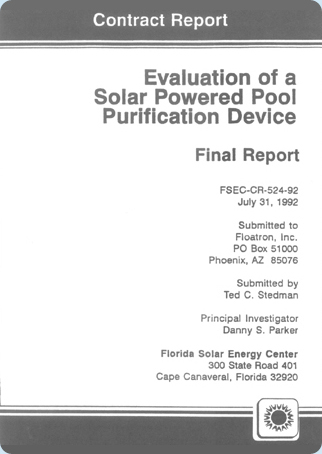 On May 3, 1992 , the Florida Solar Energy Center (FSEC) began the evaluation of a solar powered pool purification device designed and manufactured by the floatron corporation. The evaluation lasted eight weeks and concluded on June 28, 1992 . The floatron unit utilizes a small photovoitaic panel to supply electricity to two electrodes. These electrodes then produce a combination of copper and other ions which prevent the growth of microorganisms. The device floats in the pool and works when exposed to sunlight. During the test period the pool had a water sample drawn daily and this sample was tested for pH, alkalinity, cyanuric acid, calcium hardness, total and free chlorine, copper ions and temperature. An Olympus microscope was used to check for algae and bacteria. The pool walls were also visually examined for algae as pert of the daily tests. The evaluation was conducted in three stages: 1) standard pool operation with chlorine, 2) floatron device with the chlorine level dropping to zero, and 3) no chlorine or floatron. In addition, the device was evaluated in FSEC's photovoltaic labs. As a result of our evaluation, we are able to conclude that the floatron device is very effective at reducing the amount of chemicals required to maintain an algae and bacteria free swimming pool. The device produced a measurable amount of copper ions after one week of use and a sufficient level of ions for pool purification (0.2 ppm) after eleven days of use. The floatron unit was able to maintain the pool clarity without any measurable chlorine for over one week, but best results were obtained with a trace amount of chlorine. A free chlorine level of 0.5 ppm, which is about 25% of the average recommended chlorine level, is sufficient for good clarity while preventing bacteria growth. The test pool owner had previously experienced a problem with pernicious yellow algae on the east wall of the test pool. This problem was eliminated by the floatron, and at no time during the testing of the device was algae growth observed, in spite of very warm water conditions. The ion level produced by the device did not diminish rapidly after the floatron was removed from the pool. The ion level took over a week to drop from 0.40 ppm to 0.30 ppm and measurable ions were still present after three weeks without the device. Pool clarity did not diminish until three weeks after the chlorine level reached zero, partially as the result of heavy rains (over four inches in three days). Finally, the electrical performance characteristics of the device were found to be quite satisfactory for the proper functioning of the unit, with 1.53 watts produced under full sun. Based on the polycrystalline structure of the photovoltaic cells, the device should be able to produce the necessary power for at least ten years. It should be noted that the principal investigator has used a floatron in his own pool for over a year. He has experienced few problems with the device, floating it every other week and using less than 13 gallons of chlorine during the year. There are over three million in ground swimming pools in the United States according to the latest estimates by the Swimming Pool Manufacturers Association. The National Pool and Spa Institute estimates that as of July of 1991 Florida alone had over 530,000 of these pools. Sanitizing chemicals such as chlorine are used to maintain the water in the majority of these pools. In the late 1960's and early 1970's NASA conducted research into alternative methods of water purification to provide astronauts with a reliable source of safe drinking water (Jasionowski and Allen, 1974; See, Bodo and Kacholia, 1975). ionization of copper and silver electrodes was found to be an effective method preventing algae and bacteria growth. As has been the case with other technology developed for the space program, this ionization process has transferred to consumer products. The floatron CORPORATION has combined two space technologies (ionization and photovoltaic cells) to create a self contained pool purification device. FSEC was approached to supervise an evaluation of the floatron device in a typical Florida pool. This report documents the test and its finding. The FSEC test is supplemented by the experience of the principal investigator in using one of the floatron units in his personal pool over the last year. A three-phase experimental test was conducted to evaluate the device. A 15 X 30 foot (oval) 17,000 gallon marcite pool located on Merritt Island was selected as being representative of the physical characteristics which are similar to many other pools in the Florida area. This pool is not screened and receives direct sunlight during daylight hours except the early morning, when the residence shades the eastern side of the pool. The sanitizer to the pool is supplied by an automatic chlorinator which is plumbed inline and downstream of the pump and filter. The owner used three inch chlorine tablets as a sanitizer, setting the chlorinator's flow rate in the summer months (April through September) to use three tablets per week and in winter months (October through March) to use one tablet per week. Algicide in the amount of approximately one gallon per month was used to control yellow algae which primarily formed on the east wall of the pool. The pump powering the filtration system operates eight hours a day through a timeclock switch. In the first phase of the test the pool was monitored far one week with the owner's normal chemical usage and procedure. Brushing of the pool wails was done twice per week and a thorough cleaning of the bottom by vacuum performed once a week. Visual pool wall and microscopic pool water observations were also conducted daily for algae and bacteria using an Olympus microscope with video monitoring capability. Chemical usage and pool water chemistry (pH, total alkalinity, calcium hardness, total and free chlorine, cyanuric acid, air and water temperature) were monitored daily using a Taylor model K-2005 complete test kit. The free chlorine level was maintained by the owner at a fairly high level of 8.0 ppm in order to control algae. Calcium hardness was also at a high level (over 600 ppm). The owner attributed this to the pool having been originally filled with well water. All other water chemistry parameters were within normal ranges. At the beginning of phase one total alkalinity was slightly high and adjusted to proper level. Chlorine costs based on the pool owner's past year receipts worked out to slightly over $300.00 per year. The second phase of the test began during the second week with the Floatron unit being placed in the pool. The device was tethered by a nylon string to the pool ladder, which allowed it to float near the skimmer. A Taylor K-1730 capper ion test kit was used to monitor ion levels along with the other daily test. After seven days a measurable level of copper Ions (0.05 ppm) was able to be detected. After eleven days the level had reached the minimum level recommended by the manufacturer (0.20 ppm) and the chlorine levels were allowed to drop. Chlorine levels reached zero after the device had been used for a month. The calcium hardness level dropped from the 800 ppm range to the 500 ppm range during phase two. All other pool chemistry parameters remained in normal limits, and NO ALGAE OR BACTERIA GROWTH WAS OBSERVED. Phase three began at this point, with no chlorine and the floatron device removed from the pool. The copper ion level remained within the manufacturer's recommended range (0.20 to 0.40 ppm) for 25 days. During this period there was no observable algae or bacteria growth and the pool maintained excellent clarity. This is considered to be a favorable result since pool temperatures averaged a warm 82.7 F. The test was terminated after three weeks without the floatron device or chlorine when three days of heavy rains caused the pool clarity to degrade. Cyanuric acid level dropped slightly at the end of phase three. All other pool chemistry levels remained constant. As of July 30, 1992 , the project principal investigator has used a floatron in his personal pool over a year long period. The pool is located in Cocoa Beach , Florida . The pool is located on the south side of the home and is unscreened and unshaded with a volume of approximately 12,000 gallons. Prior to installation of the floatron device the pool was requiring approximately 10 gallons of liquid chlorine each week during the summer months to maintain adequate chlorine levels (5.0 ppm). Approximately half this amount was required during winter months. Approximately 0.5 gallons per week of muriatic acid was also required to maintain proper pH with the extensive amount of chlorine added. The pool was pumped an average of six hours per day in summer and three hours per day in winter. Sweeping and vacuuming is performed once per week. Although one gallon of algicide was added each month, the pool had chronic problems with black algae which accumulated on the shaded south side of the marcite surfaces. This problem was very difficult to combat, further increasing chlorine and algicide requirements as well as vigorous brushing with a stainless steel brush for removal. 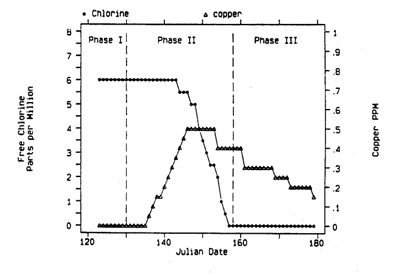 Once installed, the floatron device was able to Increase the copper ion level to 0.2 ppm within a period of two weeks of use. Initially, the copper level was checked frequently to determine when to float or remove the device. However, based on experience, the principal Investigator has found that floating the unit every other week creates the required Ion level without constant measurement. As recommended, the chlorine levels were slowly reduced such that approximately one quart of chlorine is now added each week. This trace level is maintained to provide oxidation necessary to provide proper pool clarity. It should be noted, however, that the user was once away for a month long trip where the floatron was floated, but no chlorine was added. Upon return, no algae growth was in evidence and after pool cleaning and addition of trace chlorine, the pool was once again sparkling clear. Since the floatron has been used, the user's problem with black algae has disappeared. Furthermore, at no time, since the device has been used has there been any evidence of algae growth. The amount of time required for pool maintenance has been greatly reduced (as well as the necessary trips to procure pool chemicals). The operation of the unit has been entirely satisfactory. The floatron device is very effective at eliminating algae. The test pool required a once a month introduction of algicide to stop growth on the east wall prior to the introduction of the device. Within ten days of the Introduction of the floatron device to the pool the algae was eliminated and did not recur during the test period. The floatron device begins producing ions immediately after being placed in a pool when exposed to sunlight, and will produce ion levels sufficient for pool purification within two weeks (depending on pool volume) provided insolation levels are sufficient. The floatron device greatly reduces the need for chlorine. Based on the results of the test, it appears that the test pool will operate with between 75-85% less chlorine, depending on bather load, when the copper ion level is maintained within the manufacturer's recommended range. The Ion levels produced by the device drop fairly slowly. In the test pool, it took over three weeks for the level to drop from the top of the recommended level (0.40 ppm) to the bottom recommended level (0.20 ppm). The electrical performance of the unit is sufficient to produce ions under various solar conditions. The floatron device reduces calcium hardness levels and water hardness levels by precipitating these metals onto the coil electrode. The device lowered the calcium hardness level in the pool by 100 ppm during the test period. In summary, based on our test results and year of experience we find that the floatron device is an effective way to reduce chemical use and eliminate algae while maintaining superior water chemistry.